Buckthorn (Rhamnus) constitutes a genus in the family of buckthorn plants (Rhamnaceae). There are more than 100 species of the genus, some deciduous and some evergreen. They are often found as thorny shrubs or small trees. The bark is dark and the leaves are single. The flowers are inconspicuous, giving rise to fleshy berries the size of a pea, which are distributed by the birds. The German name of the genus (Kreuzdorn) relates to the position of the thorns on the straight branches, together forming a right-angled cross. 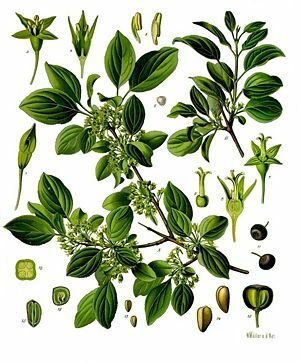 The botanical name goes back to the ancient physician and natural scientist Dioskorides, who gave the collective name of Rhamnus to a number of thorn bushes of the Mediterranean region. The genus is closely related to that of the Frangula (alder buckthorn).